St. Tropez. 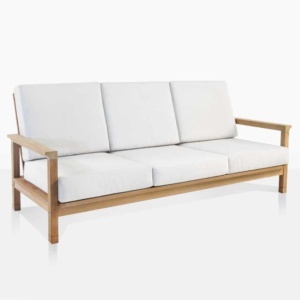 We all know the name: a quintessential seaside French town famous for its glamour, rich culture and continues to be a popular destination… Now transpose all that information and place it right into our fabulous St. Tropez Teak Outdoor Furniture Collection! 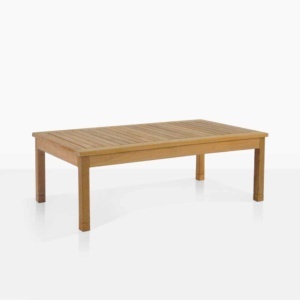 Clean, simple lines with a balmy flavour and a timeless feel; this expansive collection of Teak Outdoor Furniture will add a sumptuous edge to your home and garden. 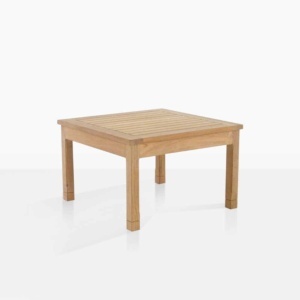 The design is taken from traditional principles; smooth cuts of wood in a precise, succinct frame, with a lovely wing curve on the arms of the seating and tops of the tables, and a delicate carved detail on the legs. 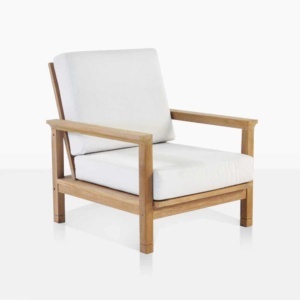 These subtle features make this classic set of teak outdoor furniture stand out from the rest. 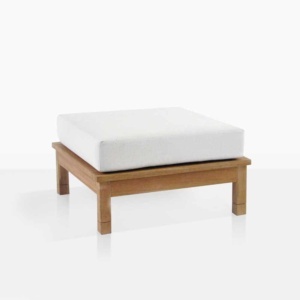 The 6-piece St. Tropez Outdoor Furniture Collection features the St. Tropez 3-seater Sofa, St. Tropez 2-seater Loveseat, St. Tropez Club Chair, St. Tropez Ottoman, St. Tropez SideTable and the St. Tropez Coffee Table. The St. Tropez Collection is crafted from the finest Grade-A Teak – recognized for its high levels of oil and rubber content, ensuring a long life – with marine grade glues and high quality hardware fittings, and cushioned with amazing Quick Dry Foam and the delightful and durable Sunbrella® fabric; these will be pieces you will love for years upon years to come. 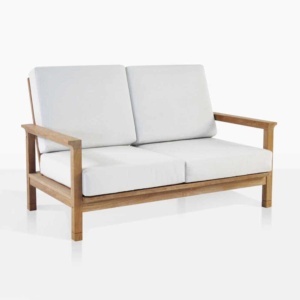 This set of teak outdoor furniture features Quick dry foam inside Sunbrella® fabric on cushions. Includes FREE Sunbrella® Cushions! Cushions are available in Canvas and Taupe. Colour Shown is Canvas.